On May 22, 2018, the Craig Needles Show (radio AM980, London, Ontario) hosted a debate among the PC, Liberal, NDP, and Green Party candidates in the riding of London North Centre in advance of the June 7, 2018 Ontario provincial general election. FP leader Paul McKeever was not invited even though he was one of the candidates in the riding. Prior to the London North Centre debate, McKeever wrote to Needles, who said he’d call McKeever – after the debate – to set up an interview. The interview occurred on May 24, 2018. One day later, Needles held a “Friday Round Table” discussion with a panel consisting of Cheryl Miller (who ran as the Ontario PC candidate in the riding of London Fanshawe in 2011), Conservative party staffer Nathan Caranci, and former PC candidate (in the 2013 London West by-election) Ali Chahbar. The three partisans weighed-in about who should be included in candidate debates during elections. Panelist Ali Chahbar – who McKeever had, during the London West by-election of 2013, questioned about Chahbar’s sympathies for the Liberal Party and Shariah law (Chahbar lost that election, arguably as a result; see Londoners alarmed by sudden emergence of info re: Ontario PC candidate, Ali Chahbar and McKeever debates Chahbar (in 2013) on Andy Oudman show) – asked his fellow Progressive Conservative panelists whether an exception should be made for a party’s leader, and he specifically mentioned FP leader Paul McKeever as an example (Chahbar, clearly, was aware that McKeever had been a guest of Needles’ show one day prior). Needles said that he was “quite comfortable” with his show’s decision to exclude candidates whose parties had not won at least 2% of the vote in the previous election because Elections Ontario uses 2% as the threshold (on a per-riding basis) for provincial funding (NOTE: FP had achieved over 2% in London North Centre in the 2014 election, but McKeever was excluded from the London North Centre debate nonetheless, rendering Needles’ excuse for excluding McKeever disingenuous or, at least, wilfully blind). The response from the all-PC panel: “NO!!”. Chahbar followed-up by saying (of course) that he agreed with their sentiment: FP’s candidate should not be permitted to participate in the on-air candidates’ debate. 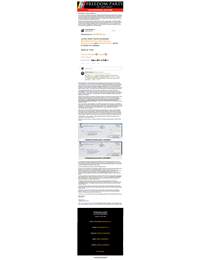 Caranci expressed his love for the fact that everyone on the panel was “shot out of a cannon today” to which the host says “yes, McKeever”, after having explained that he’d received a number of e-mails about McKeever’s exclusion from the debate. The whole charade underscores the desperate measures to which Ontario’s Progressive Conservatives are willing to conspire and resort to smears to prevent the emergence of Freedom Party as a party known to the public, and as a competitor to the Ontario PC party. We think they doth protest too much. MEDIA RELEASE – McKeever Challenges London Candidates: For or Against London’s BRT Plan? “Freedom Party leader Paul McKeever today challenged candidates in the 4 London-area ridings (London North Centre, London Fanshawe, London West, and Elgin-Middlesex-London) to state clearly whether they are for or against the Bus Rapid Transit (“BRT”) plan, and whether they are in favour or opposed to provincial funding for the BRT…” Click here to read the full media release. 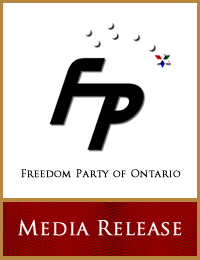 “The London-based Freedom Party of Ontario today announced that, in the 2018 provincial election, party leader Paul McKeever will run in the riding of London North Centre….” Click here to read the full media release.